The UW Libraries Catalog is especially useful when searching for a known item (a specific title or author's work). Limit your search to items in Special Collections by selecting "UW Special Collections" under "Search Scope" in Advanced Search. If you are looking for information about Pacific Northwest topics, get started with our Pacific Northwest Reference Collection. If you are looking for articles about the Pacific Northwest in newspapers or periodicals, you can search for citations in the Pacific Northwest Regional Newspaper and Periodical Index. Citations since 1996 and select other entries are available online; however, most of the citations are only available in the card files in the Special Collections Reference Area. The America History & Life database indexes scholarly publications and the Washington State Newsstand indexes 18 Washington newspapers since the mid-1980s, but access to these resources is limited to the UW community. If you want to know which Pacific Northwest city directories and phonebooks Special Collections owns, consult our list of City Directories or database of Phonebooks. Some of the special features of the collection include pre-1972 clippings on a wide range of Pacific Northwest subjects (pamphlet files), fiction set in the Pacific Northwest, explorers' journals, plat atlases, and materials on local theater, outdoor recreation, Northwest Coast Native Americans, local histories, and some funeral home records. Special Collections' historical and rare maps range from 16th-century world maps to 19th and early 20th-century Pacific Northwest maps and bird's-eye views. Most Special Collections' maps are cataloged in the Library's online catalog. Once you identify an appropriate call number, ask reference staff to also bring you related uncataloged maps to peruse as well. an atlas produced in 1975 by the Historic Seattle Preservation and Development Authority about Seattle neighborhoods. Sanborn Fire Insurance Maps may be consulted on microfilm in the Suzzallo Library's Microform department. Seattle Public Library users may also access them online. Early Washington Maps is an online map collection ranging from large-scale geographical maps to small hand-drawn sketches of settlements. The maps were selected solely from the collections University of Washington Libraries Map Collections and Washington State University's Manuscripts, Archives, and Special Collections. 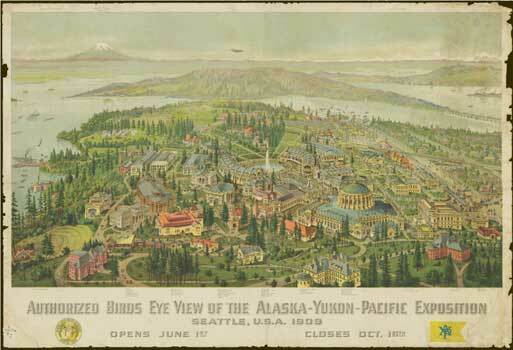 Cities from a Bird's Eye View is a guide of bird's-eye-view maps from the population boom of Pacific Northwest cities from 1870 to 1910.